Breakfast is the most important meal of the day and can make or break the day for some people. I am one of those who keeps switching between a light breakfast, full lunch and light dinner routine to a heavy brunch and early dinner kind of routine. For me it depends on my work routine, my sleep cycle that keeps changing like seasons and of course my mood. I love savoury breakfasts for myself and the husband likes his pancakes and porridge, fruits and muesli all sweetened lightly with honey or unrefined sugar. I am sure you already know our breakfast habits well if you have been reading this blog for some time. There are a few breakfasts we both like and I usually reserve them for weekends when we eat together in leisure. I meet many people who wonder how to not eat bread everyday for breakfast and still keep the breakfast filling and tasty. Including vegetables for breakfast is also a huge problem with those with a habit of toast and egg scramble type of breakfast. I have posted loads of healthy breakfast recipes in the past but more are required I felt. A series of gluten free and vegetables based breakfasts would be good to have and hence this new series of 101 gluten free breakfasts. Hope you would find it useful if you have been trying to avoid gluten for whatever reason. 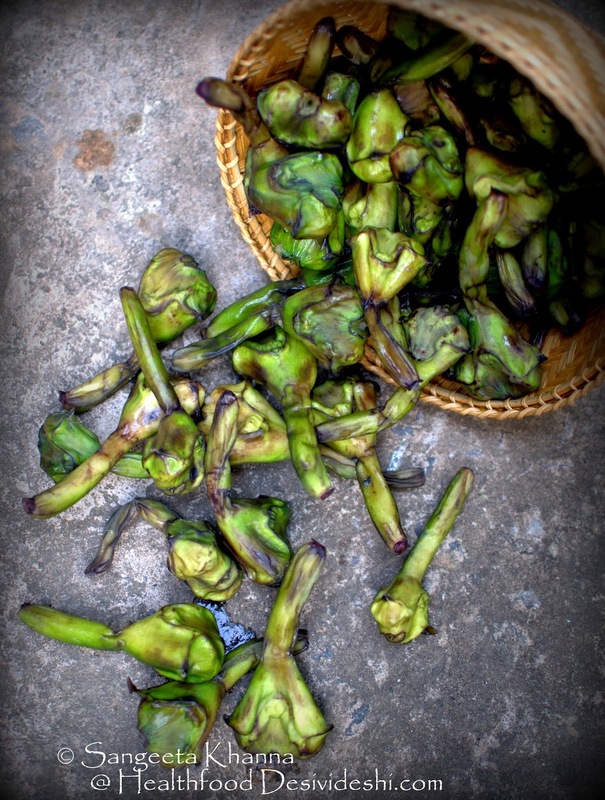 The first recipe is the wealth of this season, the fresh water chestnuts (water caltrops, singhada or paniphal) that we get for 2-3 months just before the winter starts. This is one vegetables (technically a nut) we both like and even Arvind wouldn't mind a savoury breakfast if it is made using fresh water chestnuts. He loves singhada so much he would peel while watching TV and keep them ready if required. But I get them peeled by the house help mostly and it is a great convenience if one has to make a quick snack or salad or a breakfast like this. Here is how the peeled fresh water chestnuts (caltrops) look. I keep making salads with fresh water chestnuts (singhada) and even some curries and soups as well, but having them peeled in the fridge makes one greedy and have more of this seasonal bounty of nature, that is singhada. I made this stir fry with a south Indian tadka for breakfast on a weekend and we had it with masala chai with fresh cream. We never shy away from fresh cream and ghee as these are healthy fats but I have noticed we feel better if we keep our gluten intake minimal. Please note that gluten is not bad for all but can be really nasty for some people and can be mildly problematic for others. Read my post on how gluten is not a monster but needs to be taken with caution. Heat the ghee and tip in the mustard and the lentils. Let them sizzle and get aromatic, taking care not to burn them. Now add the broken red chillies and curry leaves in that order and stir them so they release flavours in the ghee. Add the chopped water chestnuts, salt and stir to mix. Cover for 2 minutes on low flame and stir once again. It may need further cooking for 2-3 minutes but keep stirring to make sure it doesn't get burnt at the base. Add the grated fresh coconut and black pepper powder and mix well to coat everything. If the water chestnuts a little mature they would need about 6-7 minutes of total cooking for this quantity. But they are great even if half cooked as they can be eaten even raw. Serve hot for breakfast or for a tea time snack. You might like to add a few drops of lime juice but we like it as it is. It can be a great salad to be served on the side with a multi course meal as well. I cook this stir fry with a totally different seasoning and we love it both ways. This one is fragrant with cumin and freshly crushed black pepper corns. 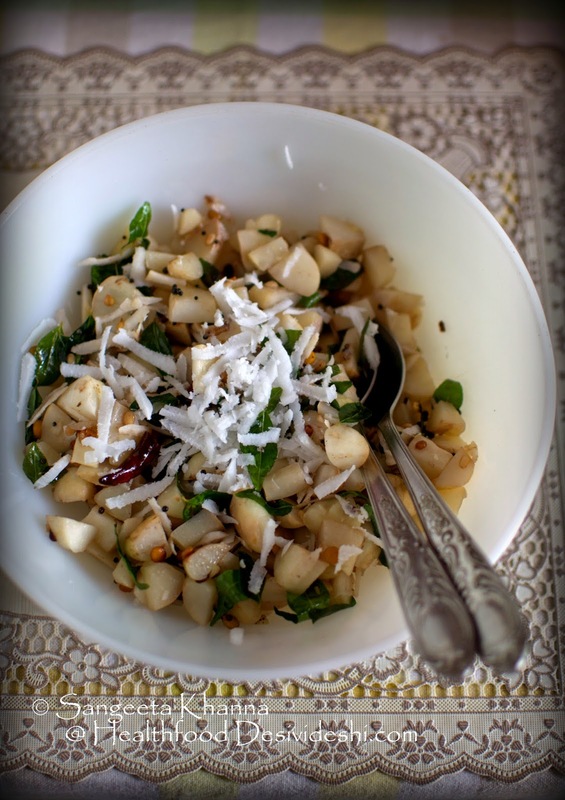 We like this water chestnuts stir fry with prominent notes of cumin if it is for an evening tea time. In this case I add a liberal amount of cumin seeds to the ghee while tempering and stir fry the finely chopped water chestnuts for a little longer time so it gets more aromatic and nutty. A final sprinkling of salt and crushed peppercorns makes the flavours linger on for long. I add roasted peanuts to the same sometimes. I am sure even you would like this fresh water chestnuts stir fry for a snack or for a breakfast. It is so quick to make once you have peeled singhade. This series of 101 gluten free breakfasts will be an eye opener for many as there are many Indian breakfast recipes that are normally gluten free. All idli and dosas are gluten free, besan ka chilla is a common breakfast in North India and mung ka chilla, pesarettu is eaten almost all over India. 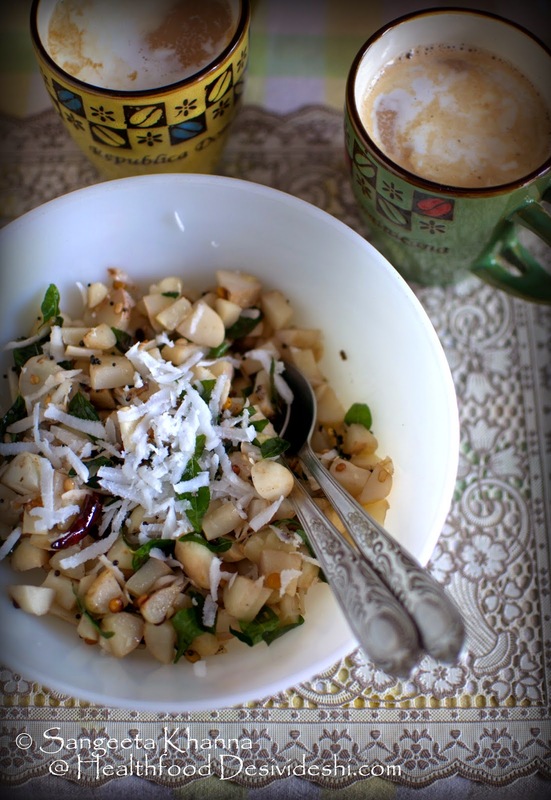 Poha is another popular breakfast dish that is naturally gluten free. Tell me if you still find it difficult to have a gluten free breakfast, I shall try and bring recipes that suit your requirements. That is really innovative sangeeta. 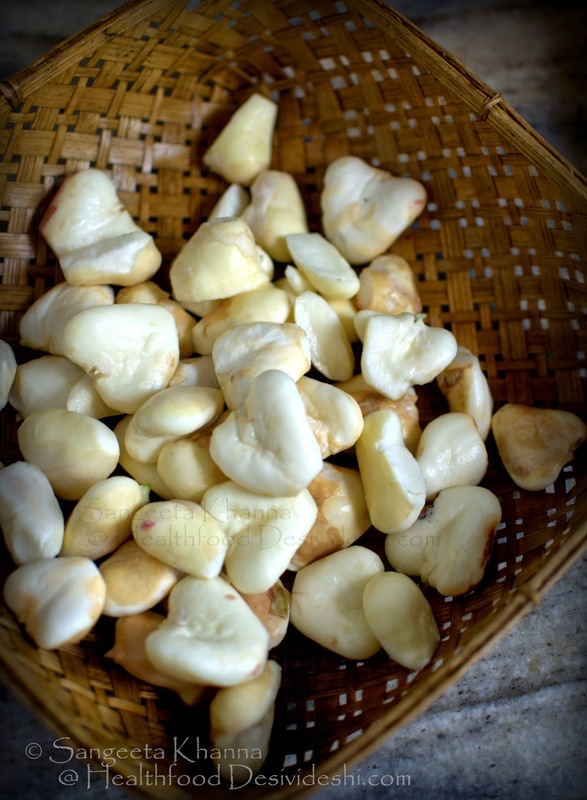 I have been devouring water chestnuts raw as they are available @ inr 20 almost half of what it was 2 weeks ago. Our state has many water bodies and hence a bountiful crop. Sangeeta can you please tell if they can be dried at home as i am unable to get the dried version or for that matter the flour. Bengalis eat the most during festivals and their concept of fasting is postponing breakfast for ashtami anjali. And few think beyond rice, wheat and maybe oats. For a nation with a rich tradition of idlis, dosas ,parathas, chapatis (the list goes on) it is a shame we have bread and cornflakes for breakfast. Yesterday I had some sattu, milk and bananas in the morning-it was tasty.filling and healthy apart from being cheap and easy(let's call it frugal). Thank you for guiding us about so many healthy alternatives. Thanks Aparna. I think you can try chopping them in slices and dehydrate them just like sun dried tomatoes. Try and see for 2 kilo singhadas. Thank You sangeeta. That seems practical. will do. Couple of years back I made amchoor following your recipe. My neice wanted to know why the home made version was lighter(colour) than store bought one. I realised that the commercial one did not bother to peel the mangoes. I do hope they wash the mangoes though for once I had witnessed papads drying on the ground( cemented). Small entrepreneurship should be encouraged but I wish some quality control and hygiene standards were maintained. Sangeeta I have dried it as per your instructions. Only problem is that two kilo has yielded very less. So now I bought 4 kgs. Do you think they can be dehydrated in a machine. West bengal Government helps general public preserve their produce ( also make achaar/jam/sauce from seasonal fruits and veggies bought from market) for a nominal fee. Peas and cabbages are dried and I could place a request for water chestnuts. Wow that looks so good. Yes you can take the help of this Government initiative to dehydrated singhada as well, may be more people will start doing it after seeing you. Please tell where in west Bengal this kind of facility is available? You are right! More people should. I saw very fresh water chestnuts(you have to see it to believe it) being sold for INR 12 at Bardhaman station on 24th November. I wish more people knew about your recipes. 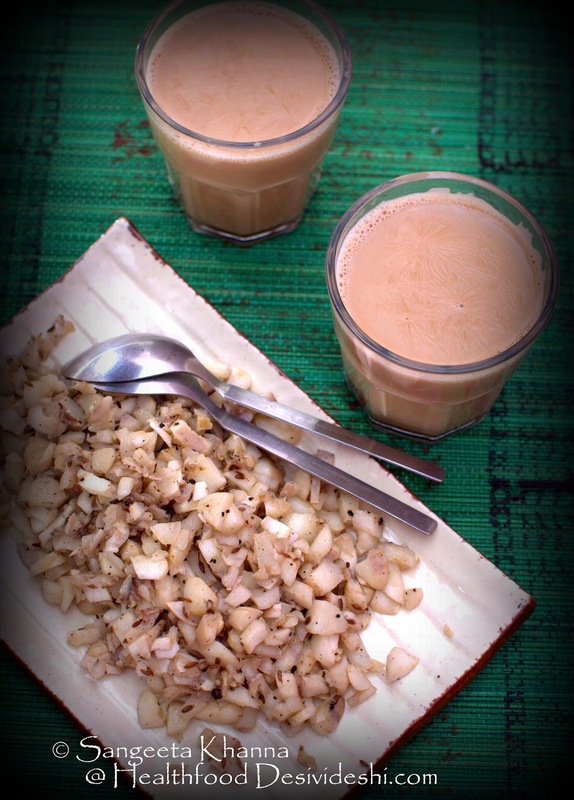 I have have heard my grand mother had a dish called Paalo which was basically a slow cooked kheer made with water chestnut paste(in our traditional sil nora) milk and sugar and flavoured with cardamom. This was typically had when she observed her fasts and refrained from eating carbohydrates. Sangeeta your ready replies are very inspiring. You might be glad to know that today I have made both amla chutney and amla achar. In Durgapur the facility is available at B Zone boys school. They even teach you how to make jam/jelly/achar/sauce in a two month course. Not only is it free they give a stipend plus certificate. What is more important is you get pure food colours, pectin, glass bottles at very reasonable prices. I even got some vinegar made apart from baigan ka achar, black grape jam, tomato sauce,tomato puree, hari mirchi ka achaar. Food preservation must be available in all cities and towns in West Bengal. It is really a boon when you have 20 kilos of tomatoes and don't know what to do with it but I some how like your achaar (why add preservatives in our traditional achaars) as my requirement is very little. And once i saw the amount of sugar that went into jams I lost all interest. But black grape jam is a beauty.